Quite a lot, as predicted. Scroll for photos and highlights from last week’s event. The view from the 15th floor of 600 Cal. Photo by Jeff Rumans. Last Tuesday night in San Francisco we gathered on the expansive, as yet unleased 15th floor of 600 California Street to discuss the workplaces of billion dollar startups with a panel that impressively, thoughtfully, prolifically walks the talk. The lineup: Denise Cherry, director of design at Studio O+A, whose client list includes Uber, Facebook, and Yelp; Chris Coleman, the former director of design for Google and Dropbox; Everett Katigbak, former brand manager for Pinterest and environmental design manager for Facebook; and Paul Singh, investor, entrepreneur, and former managing director of 1776. The panelists, from left to right: Chris Coleman, Denise Cherry, Everett Katigbak, and Paul Singh. Photo by Jeff Rumans. Conversation flowed from prompts around what types of space best support innovation in a climate of unprecedented growth and change in the tech community. Scroll for photos and to read more! Doug Lucy, the director of marketing for AgilQuest—sponsor of the entire Billion Dollar TALK series—introduces the panelists. Photo by Jeff Rumans. Space talks, investors listen. And so will your next most talented recruit. 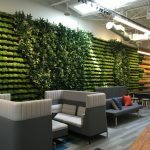 Singh said space becomes even more important at later stages as a tool to attract and retain employees, especially in the Bay Area’s competitive talent pool. “Say you’re trying to attract a VP of sales or a VP of marketing, and these are people that are coming from a larger company like Google or Salesforce and, frankly, they have certain expectations. One part of it is the comp — How much money am I going to make? — but another big part is the space,” he said. As the company gets bigger, its space gets more and more important. Culture and values always precede real estate. Designing their spaces, she said, is about supporting a culture that’s already baked into the DNA of the company. The eggs and gondolas in question. Images of Google’s Zurich office courtesy of Chris Coleman. “Zurich was designed in 2004, completed in 2005,” said Coleman, who started with the company in 2003. Most of the space is stark — lots of desks. However, for a collection of small phone booths, the architects proposed a grouping of three giant eggs. Initially, Coleman — a former set designer at CNN — put his foot down, on account of knowing “how much it’d cost to build an egg”. Taking it in stride, and inspired by their location, the team settled upon gondolas, and eventually did iterate the eggs to a point that they’d also fit within the budget. The story drew laughs, but there’s a real takeaway there, too: the ideas for the gondolas and eggs arose naturally, if cheekily, from the Zurich-based team, and supported both the company’s idiosyncratic personality, and the way those employees knew they’d use the rooms. It would have been a different story if Coleman had slapped the gondolas and eggs onto a company that didn’t want them — Dropbox, for example. Dropbox’s HQ. Image courtesy of Chris Coleman. According to Cherry, Uber and Yelp’s cultures, too, set the tone for the design process. Images of Yelp’s HQ courtesy of Denise Cherry. Images of Uber’s HQ courtesy of Denise Cherry. Technology? Meh. Even Pinterest still pins up. When we posed a question about technology at work, it was met with a totally refreshing ¯\_(ツ)_/¯ from the panelists. That said, virtual tools can be used to a workplace’s advantage. Here the conversation took a turn to virtual space and branding — not necessarily using technology at work, but using technology to brand and spread the word about interacting with physical space. Singh said that he’s seen many of his portfolio companies use the Facebook check-in feature on Meraki’s wireless access points to great effect. Most importantly, the workplace should be a platform where interesting things happen. Katigbak (seated) in Facebook’s Analog Research Lab. Image courtesy of Everett Katigbak. The same ethos that allowed the lab to sprout and blossom was present when Facebook acquired the building that they worked with Cherry and O+A to design. Thank you again to everyone who joined us last week in San Francisco, and special thank you to our event sponsors: AgilQuest, Humanscale, Knoll, Condeco, MEPT, Turner Construction, and IIDA!